If you want to kill somebody in Los Angeles … and get away with it … jump into a car and run them down while they're in a crosswalk. Chances are that the authorities will scratch their heads, do a study and then remove the offending crosswalk and/or raise the speed limit and you'll end up getting an apology for any road hazards that interfered with your journey. Three months ago, at 6:35 in the morning, 58-year-old Gwendolyn Coleman stood at the corner of 5th and Flower in Downtown and waited for the light to turn green. 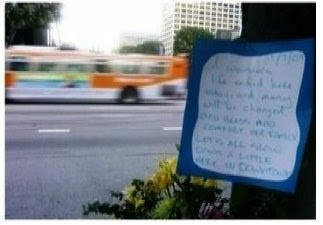 As she crossed the street, a DASH bus turned left onto Flower and struck Coleman who died at the scene. The bus operator explained that he did not see her because of a blind spot. at the limit line, looked and didn't see anybody and then proceeded. The police have determined that the death was the fault of the victim. This past Sunday, at three in the morning, 19-year-old Adrianna Bachan was in the crosswalk at Jefferson Boulevard and Hoover when she was struck and killed by a hit-and-run driver. Later that night, 56-year-old Agapito Gaspar Nicholas was in the crosswalk at Figueroa and Avenue 51 in Highland Park when he was struck and killed by a hit-and-run driver. This past Tuesday night, at 6:25 in the evening, Alina Sheyman and Maria Velasquez, both in their 70's, were killed in the crosswalk of Fountain & La Brea when a left turning car hit another car and caused it to spin out of control, killing the two women. (This intersection is the border of Los Angeles and West Hollywood.) The motorists were released. Through it all, the primacy of the motor vehicle remains unchallenged while pedestrians are killed on a regular basis. Adding insult to injury … or death, speed limits are being raised and crosswalks are being removed, both of which discourage pedestrians and communicate clearly that the streets of Los Angeles streets aren't made for walking. From the NoHo Arts District to Woodland Hills, crosswalks get targeted for removal, first with a sign that indicates "This marked crosswalk at this location is proposed to be removed as part of a traffic safety improvement." The logic behind the crosswalk removal is that they give pedestrians a false sense of security. Instead of posting "Abandon all hope..." signs throughout the City, imagine what would happen if we worked together to create that elusive "sense of security" instead of simply denying any grounds for its existence. Incredible community capital is repeatedly wasted in debating the logic, the law and the engineering behind the speed limit increase proposals and the city's policy for the removal of crosswalks. has the most significant traffic congestion in the nation. Our City's leadership has failed in their mandate to make safety on our streets a priority by not addressing this situation with an aggressive context specific solution. Meanwhile, traffic engineers argue for the removal of crosswalks in Los Angeles, pointing to a study performed several decades ago in San Diego that indicates that less traffic fatalities occur without a crosswalk than with a crosswalk. The LADOT performed its own study some time ago and repeated the results, all of which is the foundation for the City's policy to reevaluate existing crosswalks periodically and to remove them when resurfacing and restriping streets. While it's true that the studies demonstrate a reduction in traffic fatalities at locations that had crosswalks removed, the City is unable to determine how much of that is due to a simple reduction in the number of pedestrians crossing the street. Also, LA's study failed to include incidents that involved turning vehicles, yet that is the dangerous and common situation that took the lives of the aforementioned of Coleman, Santos, Shayman and Velasquez. Hardly conclusive and hardly satisfactory. The real opportunity here is for the City of Los Angeles to move from a reactive approach to traffic safety and to develop a vision for public safety that goes beyond writing speeding tickets and restricting pedestrians and actually includes a full complement of traffic solutions and puts a premium on the safety of everybody on the streets. It's not too late for us to honor Gwendolyn Coleman by working together to make 5th and Flower a pedestrian oriented intersection. It's not too late for us to create "ped zones" around CSUN and USC and other schools that guarantee that they are the safest places for pedestrians instead of the most dangerous. It's not too late for us to create a full tool box of traffic calming solutions and to move speed limit increases to the end of the list of options after road diets, traffic calming and significant safety engineering that provides a safe and level playing field for pedestrians, cyclists and mass transit passengers in their daily joust with motorists.